We welcome amateur singers with some choral experience and good sight-reading skills. Rehearsals are held on Wednesday evenings during term time and also on the Monday before a concert from 8.00 pm – 10.00 pm at The Beaconsfield School, Wattleton Road, Beaconsfield HP9 1SJ. Membership is by audition. 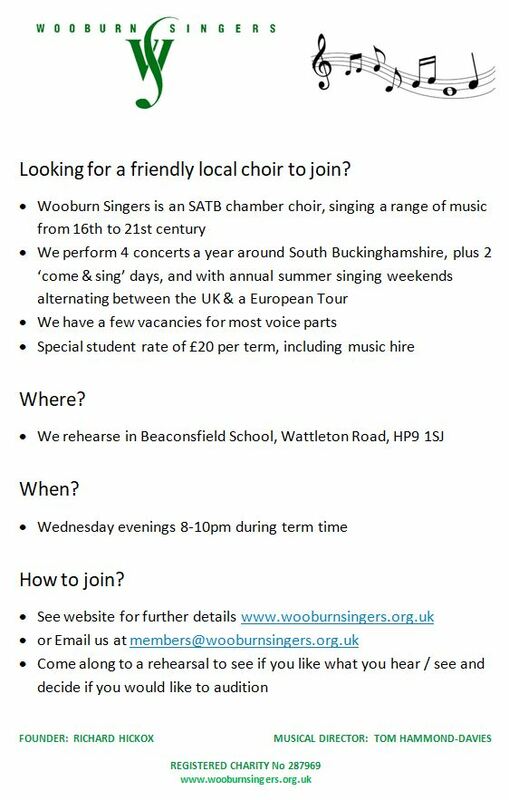 Please email members@wooburnsingers.org.uk for more details, or to arrange to visit for a few rehearsals prior to audition to see if you like what you hear / see!